Birthplace : Hereford, Texas, U.S.
Edgar Mitchell became the sixth person to walk on the surface of the moon during the third manned moon mission, Apollo 14. With him on the surface was Alan B. Shepard, who had made history in 1961 as the first American in space. The two landed on the moon aboard Apollo 14 's lunar module Antares in February 1971, while crewmate Stuart A. Roosa orbited the moon aboard the mission's command module Kitty Hawk. Born in Hereford, Texas, on September 17, 1930, Edgar Dean Mitchell grew up in the southwest, attending elementary school in Roswell, New Mexico, a town that would later become famous for its UFO sightings. His father was a rancher, his mother a fundamentalist Baptist. Mitchell learned to fly an airplane when he was just 13 years old, even before attending high school in Artesia, New Mexico. Artesia, where he spent his teenage years, was the city he thereafter considered his hometown. After high school Mitchell went on to the Carnegie Institute of Technology, graduating in 1952 with a bachelor of science degree in industrial management. Next, he attended the U.S. Naval Postgraduate School, from which he graduated in 1961 with another B.S., this one in aeronautical engineering. He completed his academic career in 1964 when he received a doctorate of science degree in aeronautics/astronautics from the Massachusetts Institute of Technology. Mitchell joined the U.S. Navy in 1952 and went through basic training at the San Diego Recruit Depot. He was commissioned as an ensign after graduating from the Officers Candidate School in Newport, Rhode Island. After completing flight training at Hutchinson, Kansas, in 1954, he joined Patrol Squadron 29 and was sent to Okinawa, Japan. In 1957 Mitchell was assigned to Heavy Attack Squadron Two operating on the aircraft carriers USS Bon Homme Richard and USS Ticonderoga. Afterwards, he became a test pilot for Air Development Squadron Five, which he served until 1959. Between 1964 and 1965 he was part of the Navy's Manned Orbiting Laboratory program as head of the project management division. When this program stalled, he left it to join the astronaut corps. Mitchell had to follow a long, hard career path in order to become an astronaut. As he recalled to Eric M. Jones for the online Apollo Lunar Surface Journal, "I'd applied at every opportunity from 1958 on. But my jet hours weren't enough, since I'd started out in props. … Building up my jet hours … and then getting my test pilot credentials … took me until I was 36. It took me damn near nine years to get all the qualifications … in order to be selected." Selected as one of the National Aeronautics and Space Administration's (NASA's) fifth group of astronauts in 1966, Mitchell joined Project "Apollo," America's manned moon landing program. He worked on the Apollo 9 mission as a member of the astronaut support crew while the mission test-flew the lunar module designed to land astronauts on the moon in low Earth orbit. He then became backup lunar module pilot for the Apollo 10 mission, a dress-rehearsal for the first moon landing in which astronauts Gene Cernan and Tom Stafford descended to within 50,000 feet of the lunar surface. A member of the lunar module design team, Mitchell was an expert on lunar module systems. In 1970, when Apollo 13 suffered an onboard explosion that ruined the mission and nearly killed its crew, he was called on as an advisor in the effort that got the astronauts home safely. As he later told Jones, "During the Apollo 13 experience, where Fred and Jim had to bring their lunar module back as a lifeboat, I spent the five days of that emergency in the lunar module simulator, creating the procedures they had to use. And radioing them up to them in space." 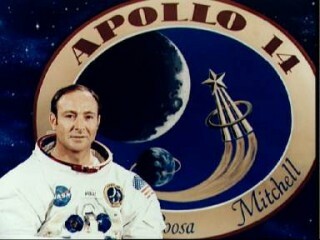 Mitchell got his chance to go to the moon himself in 1971. His ship was Apollo 14, and along for his ride were Alan B. Shepard, commander, and Stuart A. Roosa, command module pilot. Mitchell and Shepard were to land on the moon in Apollo 14's lunar module Antares, while Roosa orbited the moon aboard the ship's command module Kitty Hawk. The mission, Mitchell's only trip into space, was the second trip for Shepard, who had previous been aboard the one-man Mercury capsule, Freedom 7. That flight had lasted just 15 minutes, not even reaching Earth orbit, and Shepard was eager to return to space. Unfortunately fate intervened in the form of an inner ear disorder known as Meniere's syndrome, which affected Shepard's balance and took him off active flight status. However, he wasted no time in becoming one of two astronauts in charge of crew selection at NASA, and after an experimental surgical procedure cured his affliction, he got himself assigned to the Apollo 14 crew. Two major glitches marred an otherwise perfect flight. On the way out to the moon, just two hours after leaving Earth's orbit, the command module failed to dock to the lunar module. This was an essential procedure, and a landing could not be accomplished without it. Four attempts failed to engage the docking mechanism, and the two spacecrafts simply bounced off each other without connecting. Just when it seemed the mission might be lost, controllers in Houston radioed up a plan that might work: use the command module's thrusters to hold the two spacecraft together while Shepard threw a switch to retract a docking probe. The plan worked. During his first sleep period in space, and every other sleep period during the mission, Mitchell conducted a secret procedure of his own. Long interested in the untapped potential of the human mind, he had arranged an extra sensory perception (ESP) experiment with collaborators on Earth. According to plan, Mitchell waited until 45 minutes past the start of sleep time on the ship and then concentrated on a series of symbols and shapes printed on a clipboard. Four men on Earth tried to "receive" in their minds the shapes that Mitchell concentrated on. The second major glitch of the mission occurred as Antares headed down from lunar orbit to the moon's surface. At 30,000 feet, the landing radar refused to engage as it was supposed to. As Mitchell later told Jones, "When it didn't come in by 30 thousand, we got alarmed. And at 20 thousand feet, that's when we were frantically trying to get it to come in because, at 10 thousand feet, there was automatic (meaning 'mandatory') abort without landing radar." If the landing radar did not come on, mission rules stated that the astronauts would have to abort the mission and return to lunar orbit without ever setting foot on the moon. Fortunately, all it took was simply turning the radar off and then on again to get it to engage, and the mission proceeded as planned. On February 5, 1971, Mitchell and Shepard touched down to a feather-light landing in the highlands of the moon's Fra Mauro region. The mission set a record for longest time spent on the surface (33 hours), longest time spend on the moon outside of a spacecraft (more than 9 hours in two excursions), and the most lunar sample material returned from Earth (some 100 pounds). The mission also marked the first use of a color television camera for transmitting video back to Earth. After serving as backup lunar module pilot for the Apollo 16 mission, Mitchell retired from NASA in 1972. He founded the Institute of Noetic Sciences in 1973 to "expand knowledge of the nature and potentials of the mind and spirit, and to apply that knowledge to advance health and well-being for humanity and our planet," according to the institute's Web site. From 1974 to 1978 he headed the Edgar Mitchell Corporation, based in Palm Beach, Florida, and later became head of Mitchell Communications. In 1996 Mitchell published a book about the consciousness-expanding aspects of his moon voyage titled The Way of the Explorer.